Take care of your car and keep your drive smooth. To be able to take better care of your car requires a lot of watchfulness. One needs to go for a complete auto service to keep the car going gentle and smooth. So lets us go through a few tips to be able to maintain our cars. Associate with a car care service that provide some consulting proactively and will do the services for you even when you forget. 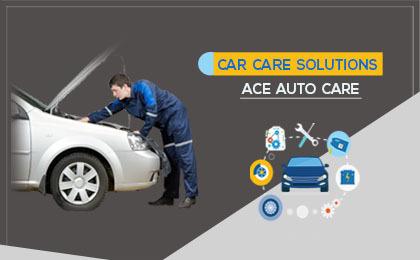 Ace Auto care is a certified auto repair shop involved in auto servicing profession for about 35 years and their three generations have researched and scrutinized thousands of vehicles during these times. The company has grown up pondering to various customers and a vast variety of car models. Your experience with them will totally take absolute care of your car. Their honesty and straightforward attitude has always kept their clients convinced at each visit. Aligned wheels will keep the life of tires outstretched, so get the wheels aligned routinely. Get regular oil changes done, since they are your best investment towards the longevity of the engine. It is advisable to get brake inspections done customarily to be able to reduce the repairing costs. Wash and polish the car regularly to keep it looking new and the car remains good in order. Keep the tires of the car inflated. Inflated tires are able to deliver a better mileage. Also tighten the gas gap more often if required. A tight gas pipe will keep the engine more durable and reliable for a longer time. Car filters must be changed timely (usually 2 years or 24000 miles) and the coolant must be checked habitually to check the functionality. As soon as you arrive at Ace Auto repair, they listen to you carefully and document the symptoms of the car. Their auto check point checklist is a very thorough check-up initiative for the car’s health. This checklist will ensure that the root cause of the problem is not left out. They stock at all times, the parts that may be required at the time of working on the car. The work starts only after a discussion with the client. They will offer you the best quotes based on their findings. The car is handed over only after a test drive with the client, to make sure that the vehicle has been serviced convincingly, Ace auto care’s checklist for diagnosis records, oil changes, brake inspections, checks tires, coolant and car filters etc. So you can be completely carefree about the upkeep of your vehicles. What is the Importance of Belts in Vehicles?